Our range of products include Bag Making Machine such as Non Woven Fabric Bag Making Machine, Coffee Bag Making Machine, Non Woven Fabric Box Type Bag Making Machine and Bubble Sheet & EPE Foam Bag Machine. 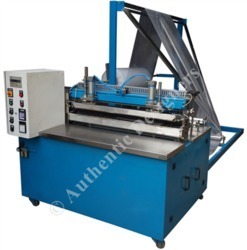 Air Bubble Sheet Bag Making Machine, HM Air Bubble Sheet Bag Making Machine. Two pouch of 500mm each can be made from the machine. Material Air Bubble Bag Making. Heavy duty , dynamically balanced Aluminium roller to support the sheet during folding operation and smooth running of sheet - 10 nos. Heavy Duty linear motion bearing slide with heavy duty pneumatic cylinders for perfect alignment of sealing bar ensuring trouble free operation. Separate Pneumatic valve for each cylinder. Highly accurate and easy to adjust M 18 Proximity sensor for sensing the sealing jaw position. Compressed Air Required 2 - 3 CFM at 6 Bar Pressure. Material EPE Foam 0.85 mm to 2.5 mm thick. 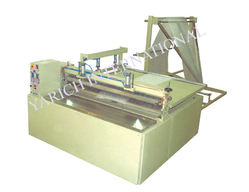 Our organization has successfully expanded its business in market owing to the offered elevated quality array of EPE Sheet bag making Machine. Manufactured by our adept professionals utilizing the best quality components and progressive technology, this foam bag machine is highly praised for its optimum quality. Apart from this, provided bag machine is rigorously tested by quality experts in order to offer zero defect products to our clients. Digital length control. Zero time for changing the size of the bag.